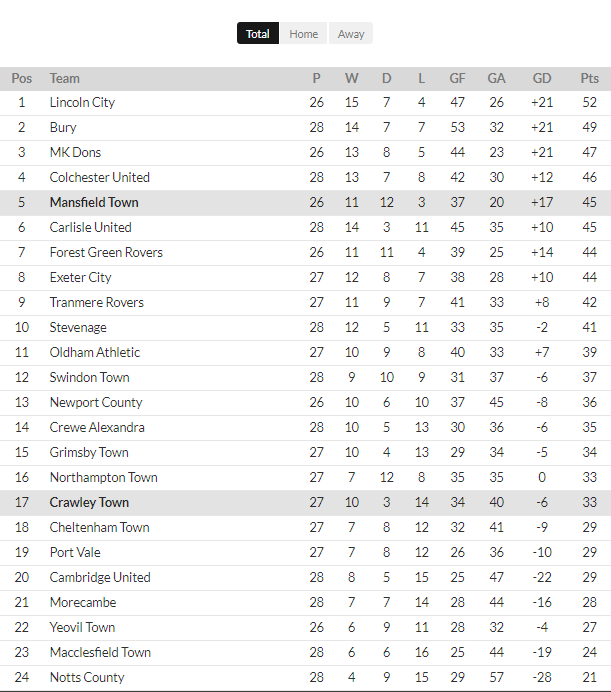 So as we enter into the new year, with the transfer window opening and around half of the games played, it seems like a good point to take stock of the situation and see who the movers and shakers are in League Two. Be sure to keep up with our daily updates on the January transfer market and take any moves into consideration as we revisit the betting markets as we hunt for some mid-season outright betting value. You can find all of our pre-season predictions here, and at the moment things are looking very nice indeed for a number of our predictions. If you missed out on this pre-season value back in August don’t worry – We’re back with a host of our favourite mid-season bets here. Remember, you can stay up to date with all of our betting tips and predictions, including match previews for every single game, on our League Two homepage. At the halfway stage of the League Two season it appears to be a two horse race for the League Two title as Danny Cowley’s Lincoln City are going head to head with Paul Tisdale’s MK Dons. The two sides have already traded blows this term with the Imps emerging victorious when the sides met back in September, and although there have been a few stumbles along the way, Lincoln have also stolen a march in the battle for the title. Sitting just below them is the MK Dons and they look well set to reclaim their spot in England’s third tier at the first time of asking. Although they did briefly hold top spot, a frustrating festive period has seen them drop to five points behind the pace setters. 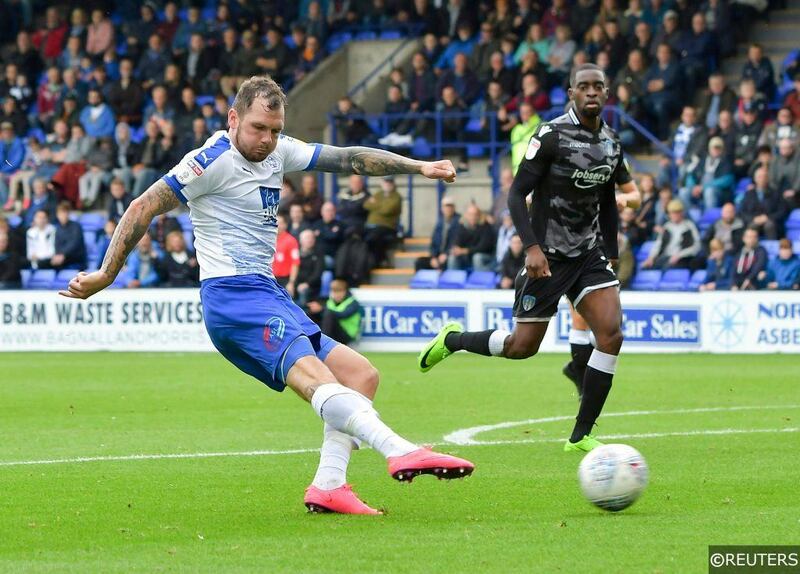 Splitting the two pace setters is a side who are also looking to bounce back from relegation at the earliest opportunity but, although Bury have the points on the board, they have played more games than many of their rivals and will know that there is still plenty of work to be done if they are to accomplish their goals. The side who are currently perhaps the form side of the four play-off place holders are Mansfield Town and, although they will no doubt have eyes on a greater prize at the end of the season, a win at Wembley in the play-offs will hardly be seen as a disappointment. Colchester United were at one stage looking likely to join the hunt for the League Two title, but their lack of ability to find the back of the net is an area which will need to be addressed and will perhaps be the difference between winning a spot in the play-offs or one of the automatic promotion places. Forest Green Rovers have been one of the surprise packages in the division but, although he has undoubted quality, the return of striker Christian Doidge from a controversial loan with Bolton Wanderers will be an interesting development to keep an eye on. Down at the other end of the division are two sides who will certainly have set their sights higher than a relegation battle at the start of the campaign. Sitting at the foot of the Football League is a Notts County side who are now on to their third manager of the campaign. The Magpies have a squad which, on paper at least, looked destined for so much more, but results and performances have not met expectations and now the side find themselves fighting to avoid dropping into non-league football for the first time in their history. Occupying the second relegation spot is a Macclesfield Town side who took a while to get going following their promotion from the National League last term. When the Silkmen dropped out of the Football League a few years ago, they left with a bit of a whimper and that form in England’s fourth tier continued for a large period at the start of the season. However, Town have since shown that their is ability in their squad and the appointment of former England defender Sol Campbell as their manager has seen them start to close the gap on those sides in the safety spot. The relegation dog fight is one that will no doubt have plenty of twists and turns to come as teams both come into and drop out of form. Both Notts County and Macclesfield Town will closely be keeping an eye on the fortunes of those sides immediately above them and with Yeovil Town, Cambridge United and Morecambe currently within striking distance, it would not shock us to see any of those three drop into the bottom two before the conclusion of the campaign. The first half of the season has seen Lincoln City as the team to beat in League Two and as we enter into the new calendar year, they sit at the top of the league with a three point cushion over their nearest rivals. The Imps have been on a steady upward curve which, in truth, started prior to the tenure of popular manager Danny Cowley. Stuck in non-league football, local manager Chris Moyses was appointed as boss and, although he ultimately did not accomplish promotion, it is his good work which many Lincoln fans credit as laying the foundation for the success they are now having. That is not to take away from the accomplishments of Danny Cowley, however, as following his move from Braintree Town to take over the Imps, he quickly found his side reacting to his methods. Not only did Cowley win promotion back to the Football League in his first season, but he has followed that up with several excellent runs in the FA Cup, victory in the Checkatrade Trophy and this season he has his sights set on winning promotion to England’s third tier. This season has gone about as well as could have been imagined for Lincoln as they sit at the top of the league, have games in hand in the team in second and a cushion over the team in third. They have also been in solid form in the cup having got as far as the FA Cup third round, the second round of the Carabao Cup and although they are out of the Checkatrade Trophy, the lack of additional fixtures could prove to be a blessing on the title run-in. Controversially born following the relocation of Wimbledon, the MK Dons have had a pretty dramatic start to their life as a football club. However, following their relegation from League One last season, they are now playing in a division lower than the phoenix club born in Wimbledon’s place, AFC Wimbledon, for the first time in their history and they are working hard to make sure it is a temporary situation. The Dons worked hard in the summer to attract former Exeter City boss Paul Tisdale, the man who was defeated in the League Two play-off final two seasons running with the Grecians, to take charge of their management and Tisdale has already ensured any relegation hangover to be pretty short lived. Although they sit in third place, the two games in hand on Bury means that the Dons are Lincoln’s closest rivals at the moment and although they have suffered a small blip over the festive period, they should strengthen in the January transfer window and at least secure one of the automatic promotion spots. Out pick for the last of the automatic promotion spots in Mansfield Town and although the Stags suffered a surprise 1-0 defeat at struggling Yeovil Town at the weekend, we think that they should bounce back in emphatic fashion to win a spot in League One which has eluded them for the last few seasons. The Stags were among the favourites to win the title at the start of the campaign but a slow start has left them playing catch-up with those currently occupying the automatic promotion places. Although the Stags have only lost three times this term, they have drawn a high number of their matches and following that defeat to Yeovil, have now lost two games in a row. However, they do have one of the most prolific strikers in the league in Tyler Walker and that is backed up by a defensive unit which tops the charts for the least amount of goals conceded as they have conceded just 20 goals in their 26 outings so far. With an ever shrinking budget and an ageing squad, Morecambe have long since been fancied to suffer the drop back to the National League. Last season they managed to avoid that fate by the skin of their teeth but we think that this year might finally be the year that sees them drop out of the Football League. The Shrimps started the season in solid fashion and managed to put some distance between themselves and the bottom two, however, they have slowly been reeled back in and with their relegation rivals all improving, it is hard to make a convincing case that sees them retain their spot in the fourth tier of English football come the end of the season. It is fair to say that the Magpies have failed to live up to those pre-season expectations and they currently find themselves adrift at the foot of the table. It is not as if they have not taken measures to try and rectify the situation either as they have parted company with two managers so far and the with the fortunes of the third barely improved, it looks like the writing may well be on the wall. Categories: Betting Odds, Blog, Football, Free Tips, and Season Outright Tips. Tags: league 2 predictions, league 2 tips, league two, and season outright tips. League: England League 2. Sports: Football.